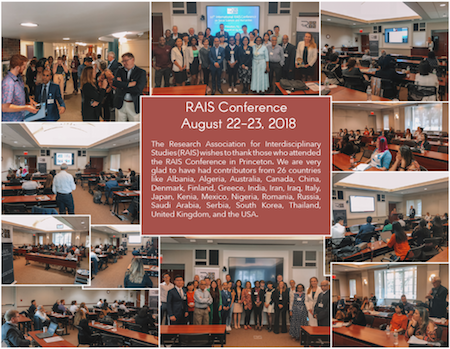 The Research Association for Interdisciplinary Studies, (RAIS) is an international, not-for-profit organization incorporated by the Maryland State Department of Assessments and Taxation, United States of America, and is exempt from federal income tax under Internal Revenue Code (IRC) Section 501(c) (3), with the mission of promoting human values through interdisciplinary research. Papers are welcome from Economics, Management and Business Studies, History of Economics, Science and Technology Studies, Politics and International Relations, Psychology and Sociology, Philosophy, Education, Social Anthropology and Linguistics, Social Policy and Social Work and Social History, Demography and Social Statistics, Methods and Computing, Development Studies, Environmental Planning, Law, Jurisprudence. More details will be provided soon. Papers are welcome from Politics and International Relations, Law, Jurisprudence, Economics, Management and Business Studies, History of Economics, Science and Technology Studies, Psychology and Sociology, Philosophy, Education, Social Anthropology, and Linguistics, Social Policy and Social Work and Social History, Demography and Social Statistics, Methods and Computing, Development Studies, Geography and Environmental Planning, and so on. RAIS encourages researchers and academics to send their abstracts and articles on interdisciplinary studies. The invitation letter can be sent to the author only after the Registration Fee has been paid. The invitation letter can be sent via email for free. If the author needs a printed invitation letter sent through mail then the author needs to pay the expenses required (e.g Postal and Notary expenses). We cannot assure you that the US Embassy will approve your visa request and we cannot contact or intervene with any Embassy or Consulate office abroad on your behalf so please begin your visa application process as soon as you determined to attend. All the presentations must be made in English. ORAL PRESENTATION - Each presentation, made by one or more speakers, must be prepared in English and should be no longer than 15 minutes, afterward, we will have around five minutes for questions and answers. We recommend delivering a PowerPoint presentation of your research work on the conference day. POSTER PRESENTATION (Attending in person) - Poster presentation will provide an opportunity for researchers to display the results and conclusions of their papers in the form a visual poster presentation. All posters will be displayed for the duration of the conference. VIRTUAL PRESENTATIONS (Not-attending authors) - RAIS allows the authors of accepted papers the same publication opportunities as regular presenters. If you are unable to attend the conference, RAIS offers you three virtual presentation options: Recorded Video Presentation, PowerPoint Presentation with voice-over, or Live Via Skype. PAPER ONLY - If you are unable to attend the conference but you want your paper to be published in one of our publication, you can choose the “Paper only” option when you submit your paper or register. For cancellations, please contact Conference Administration at rais.education@email.com. No refunds will be given for cancellations 30 days prior to the start of the conference. Research Association for Interdisciplinary Studies has leased or rented facilities from the Johns Hopkins University or the Erdman Center. However, RAIS and any programs operated by it are not related to or affiliated with the Johns Hopkins University or the Erdman Center in any way. 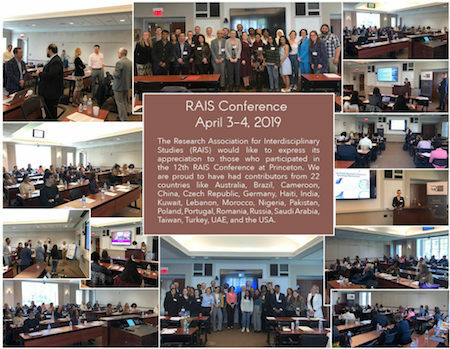 RAIS is an entirely separate legal entity with no connection to the Johns Hopkins University or Erdman Center aside from the temporary use of facility for the specified program.